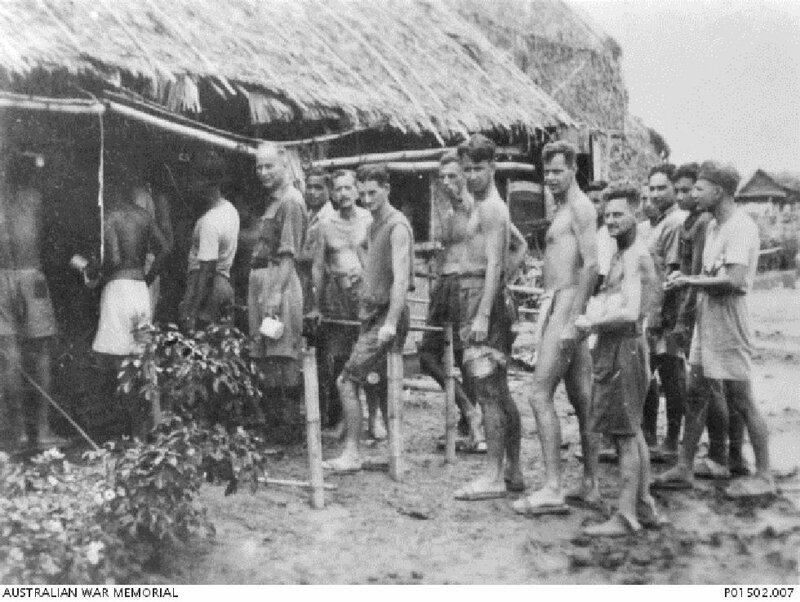 POWs line up in a meal queue at an attap canteen hut in Kanburi POW Camp, January 1945. Image courtesy of John Munslow Williams, Australian War Memorial. 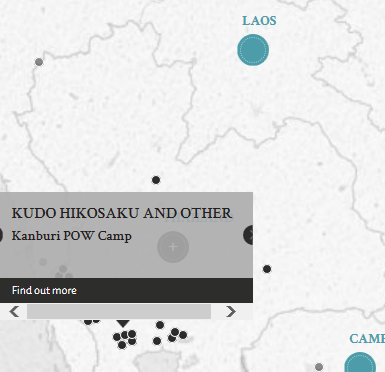 The accused of the 19th Ambulance Corps (or Kudo Butai) were charged for commiting war crimes of ill-treating POWs working on the Burma-Siam Railway between 1 August 1943 and 31 March 1945. This ill-treatment included physical beatings, poor living conditions and withholding medical supplies to the sick POWs. This resulted in the deaths and physical suffering of many POWs. During the trial, various interesting events happened. To visualise the living conditions, the court asked the guard to walk the distance indicated by witness to be the distance of the latrines from the wards. Guard walked 23 paces. Mohamed SalI, a witness, used a Malay interpreter for the examination-in-chief; but halfway through the cross-examination, the defence lawyer requested that a Tamil interpreter be used on the basis that the witness did not understand a question in Malay and understood Tamil better than Malay. Kudo, Hikosaku. Major. From Japanese military. From military. Guilty. Death by hanging. Sentence confirmed. Takano, Suteo. Second Lieutenant. From Japanese military. From Japan. Guilty. Life imprisonment. Sentence confirmed. Yaguchi, Sanya. Second Lieutenant. From Japanese military. From Japan. Not guilty. Takino, Shoichi. Second Lieutenant. From Japanese military. From Japan. Guilty. 5 years' imprisonment. Sentence confirmed. Mukaeda, Takeo. Sergeant Major. From Japanese military. From Japan. Guilty 2 years' imprisonment. Sentence confirmed. Onodera, Shoji. Lance Corporal. From Japanese military. From Japan. Guilty. Death by hanging. Sentence confirmed. Yasuda, Kinichiro. Lance Corporal. From Japanese military. From Japan. Guilty. 20 years' imprisonment. Sentence confirmed. Nishimura, Katsumi. Supply Private. From Japanese military. From Japan. Guilty. 10 years' imprisonment. Sentence confirmed. Nakamura, Jiro. Supply Private. From Japanese military. From Japan. Guilty. 6 months' imprisonment. Sentence confirmed. Tsukamoto, Chuji. Supply Private. From Japanese military. From Japan. Guilty. 15 years' imprisonment. Sentence confirmed. Fujita, Hikoichi. Supply Private. From Japanese military. From Japan. Guilty. 8 years' imprisonment. Sentence confirmed. Kato, Takeo. Supply Private. From Japanese military. From Japan. Guilty. 9 months' imprisonment. Sentence confirmed. Dumont, A. A. Major. From British military. St J Couch, E. L. Lieutenant Colonel. From British military. Solicitor. Prestt, A. H. Major. From British military. Student Member, Inner Temple. Tatsuzaki, Ei. From Japanese military. Commander, Judge Advocate General, Japanese Navy. Komori, Takesuke, From Japanese military. Lieutenant Commander, Judge Advocate General, Japanese Navy.